[Review] Is TheReferralTask a Fake or Real? TheReferralTask.com is a new website allegedly giving loads of work. But have you ever questioned its own name? This is ironic because it says it has many job offering, yet the name itself only signifies the member to JUST refer someone. Ironic isn't it? Now, the basic question is: Is it real? or yet another fake website? But my basic answer is: NOT TRUE. In short, it is FAKE! While I am confident that TheReferralTask is one of those fake websites, I will start discussing first its part. 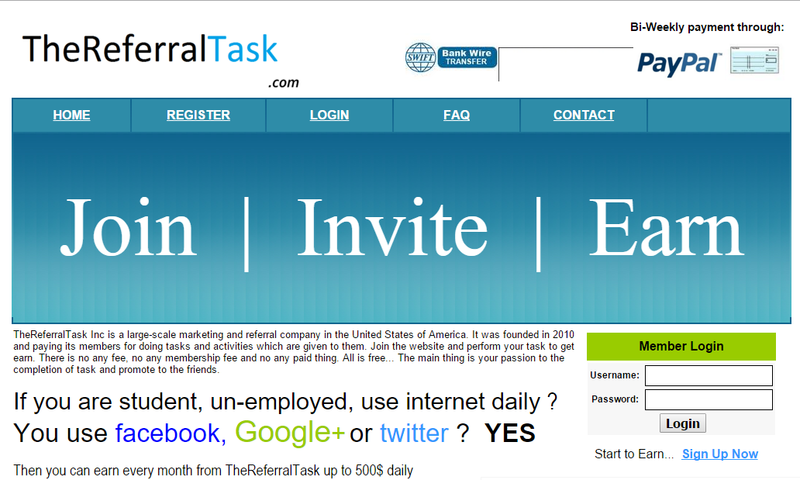 TheReferralTask Inc is a large-scale marketing and referral company in the United States of America. It was founded in 2010 and paying its members for doing tasks and activities which are given to them. Join the website and perform your task to get earn. There is no any fee, no any membership fee and no any paid thing. All is free... The main thing is your passion to the completion of task and promote to the friends. Why not try this better and legit website - ClixSense? Below is my screenshot as of November 29, 2015. See my earnings. MUST TRY: You can directly register here: Click and Join Here! According from their website, it is alledgely a large-scale company in the USA and founded last 2010. But I checked its WHOIS DOMAIN, I found out that it was created last November 25, 2015. 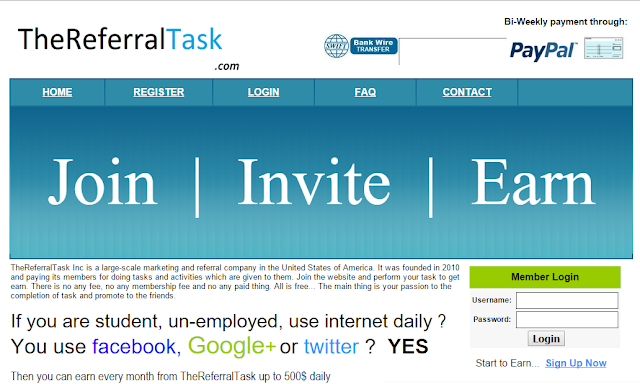 TheReferralTask interface has the similar attributes to Done4Job.com Meaning, it has no integrity and consistency. I will be straightforward with the reasons. You can check my other review with Done4Job. It is far similar in terms of the factors. One note to consider is its registration. If you have noticed, thereferraltask has quite simple fields which is suspicious. Why would a website(allegedly a large-scale company) has no comprehensive fields for members' registration? Unless it is not real. Of course, along with it, is the lack of security features a member would benefit. Where are the captchas, activation links, and secure https? TheReferralTask has no discussion page. This is quite important must-have feature in a site dealing with money. With it, members can show to other members how they get the money or give a chance to see if it is really working well. How can TheReferralTask manage to get the money in a short period of time? Does it sustain the market flow in the future? I think not, unless it is scamming the members. Thank you for contact. Our team will reply you back with in 5 - 6 working days. Don't just believe on the higher earnings you will get with this website. Yes. Also, even if it is FREE and you have nothing to lose, but your time and effort are wasted. That is more costly. Since you are really interesting earning online, I do recommend to try ClixSense. REGISTER: You can directly register here: Click and Join Here!